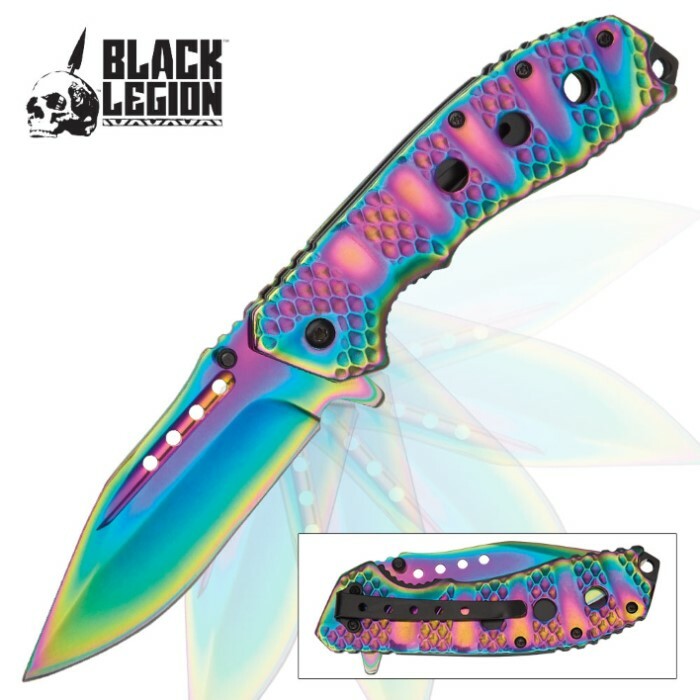 A bold, vibrant folder with muscle to match, Black Legion's brilliant rainbow-finished "Oxide" Pocket Knife dazzles the eye and conquers the trail. From the handle end to the blade point, every square millimeter of the Oxide glitters radiantly - a polychromatic masterpiece of knife design. At 3 3/4" long, the stout 3Cr13 stainless steel clip point blade is big enough and sharp enough to tackle even the most demanding cutting jobs. Its shimmering rainbow finish and stately through-hole accents ensure it looks great doing it, as well. 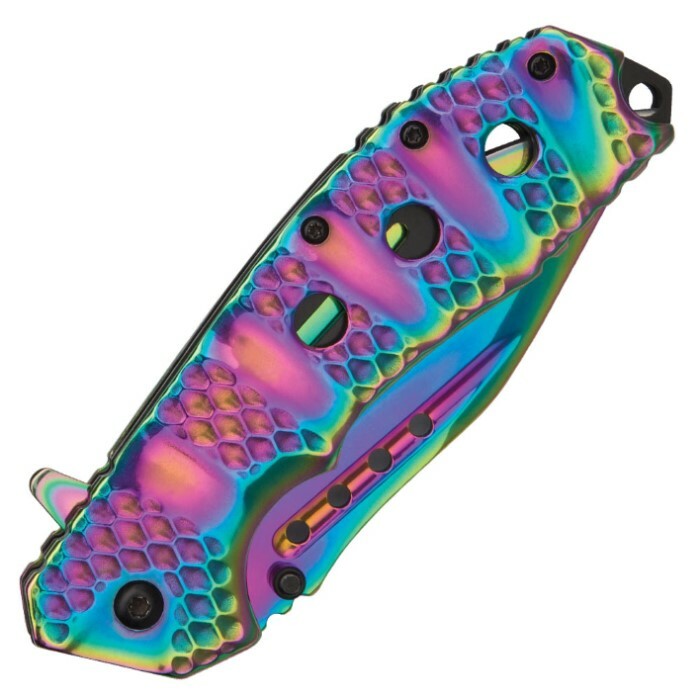 Just nudge the handy flipper or ambidextrous thumb studs and the blade deploys in a flash of prismatic color, thanks to the Oxide's glassy smooth assisted opening mechanism. Upon opening, the sturdy liner lock keeps the blade securely erect for added safety and stability - especially important while performing rigorous tasks. The lustrous gold-finished steel handle is dimpled and furrowed for a delightfully tactile, comfortable grip. Add the Oxide's ergonomic contours, ridged thumb grooves, impeccable balance and robust feel, and the result is an exceptional wielding experience every time you brandish this outstanding folder. 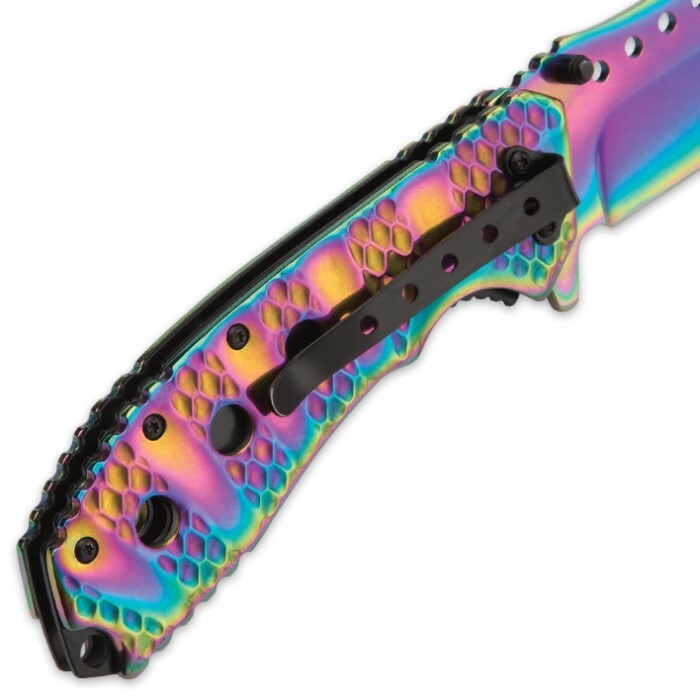 The matte black finish on the Oxide's liner, thumb studs, pocket clip, lanyard hole and fasteners provides a smart contrast to the polished rainbow effect that blankets the most of the knife. A trio of impressive handle through-holes adds yet another touch of elegant style and graceful charm. Whether for display or everyday carry, it's hard to beat Black Legion's "Oxide" Assisted Opening Pocket Knife - particularly when you consider our unbeatable prices and service! This distinctive folder is especially breathtaking when showcased alongside its sister folders - the cobalt blue "Cyanide" and elegant gold-finished "Sulfide" (both sold separately). This is a really good looking knife that has good heft to it and is reasonably priced.